Hi there, Ollie here. Last week was Digital Discovery Week at the University of Sussex, so this week’s post is about a Digital Discovery Workshop that I attended – Fake News delivered by Claire, a member of staff in the Library. Fake news is defined by Julia Hunt of the Guardian as ‘false, often sensational information disseminated under the guise of news reporting’. I think learning about how to identify fake news (as well as any other disingenuous source, including even journal articles) is an essential skill to academic study, because it ensures that you don’t unwittingly become a disseminator of false information, which may even have widespread negative effects when done on a large scale. Some fake news is humorous, for example news published on the 1stof April, or indeed every day on the website TheOnion.com. However, some fake news is malicious, for example the infamous red Brexit bus with the slogan ‘we send the EU £350 every week, let’s fund our NHS instead’. 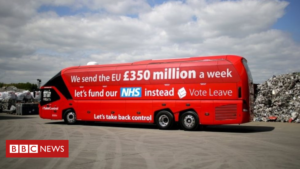 When disseminated and believed on a large scale, this false information (among others) may have changed people’s votes and subsequently the result of the Brexit referendum. When Claire asked us the question ‘do you read fake news?’, my inclination was to say ‘no’, but my honest answer was ‘I don’t know’, because fake news usually doesn’t advertise itself as such. This poses the question – how do I learn the skill of discerning whether a news source (or other information) is fake? Indeed, Frank Baker, expert of media literacy education said, ‘most of our young people cannot distinguish news from advertising’. Tools such as the fact-check unit, ‘Les Decodeurs’ (created by French newspaper Le Monde) or the website factcheck.org, fact checks each news story and website, and determines whether it’s fake. Avoiding websites and articles blacklisted by these tools will help ensure my research for my degree doesn’t include fake news. In addition, I can fact check sources by independently researching the citations given in the article. If no citations are given, that could be a sign of fake news. Lastly, I learnt that it’s important to look at the URL address, because fake sites can have URLs very similar to respected news website but with a slight variation. For example, during the US election, the fake site abcnews.com.co (imitating abcnews.com) disseminated fake news, which Donald Trump’s campaign manager re-tweeted, (probably) not realising it was not the genuine news website. I think learning these skills, either through attending workshops like the Library’s or through online research, is an essential part of learning how to research and form valid opinions, particularly in the context of science, whose foundation is built on critical evaluation. I’m a former student of the University of Sussex and saw this article. There is monetised fabrication. People knowingly pumping out rubbish (for example: ‘The Pope supports Trump’) because it’s a way of making money through Facebook / Google’s ad-revenue model (i.e click-bait style articles). This is driven in part by programmatic advertising: ad-tech follow users around, and advertise on sites they visit, irrespective of how truthful it is. This is where tech solutions CAN work – ie de-rank / de-monetise etc. Some evidence that’s working too. I’m worried about too much ‘tech’ or government involvement here – as it could go very wrong. It’s this type of fake news where I see fact checkers like FullFact (https://fullfact.org/) playing a key role. The hardliner won’t change his mind with ‘facts’ -they rarely do- but the fence-sitters might. Then there’s the much bigger issue of highly partisan, one-sided, biased news. Sometimes unintentional, sometimes editorial. This is a huge grey area, and there’s no technical or government or platform solution. Again, tech solutions / government intervention won’t work. The only solution is to dramatically increase media and information literacy in schools and beyond. Determining what is true and what is not – picking through bias and propaganda is perhaps the single most important thing kids must learn at school nowadays. But media literacy must not be ‘question everything’ – that’s the world of conspiracy theorists. Instead it’s to develop a theory of epistemology. ‘Why should I trust one thing over another thing’? It should of course include tech – how algorithms work, video splicing, especially deep fakes etc – but also psychology. Even Google’s algorithms are no match for our own powerful cognitive biases, which most of us aren’t even aware of. In fact, there’s a fourth, slightly different issue too, which I think is perhaps more important still. I call it ‘the selective omission of truth’. It is now easier than ever to surround yourself with carefully chosen TRUTHS, but which are one-sided & misleading when added up. And this final category of fake news is extremely difficult to tackle. We’ll probably never ‘solve’ that problem – as long as humans are humans. The best we’ll manage is to mitigate its worst effects and learn to live with it.